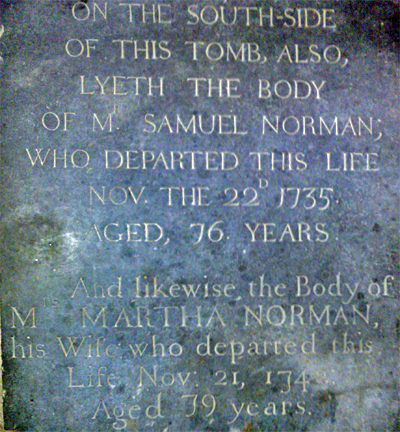 Martha was the widow of Samuel Norman (d.1735) (q.v. for more about their children) and daughter of William Gyles the elder (d.1702). She died on 2 Nov 1742 aged 79, and was buried at Keach's Meeting House. Her burial is not recorded in the parish register. See Gyles Family page. William Gyles of Towcester (the PCC clerk probably misread the place-name) was the son of Martha's brother Daniel Gyles the elder. Samuel Homes was probably the son of Mary Holmes, daughter of Daniel Gyles the elder. Samuel Gyles, son of Daniel, was a draper, later at Biggleswade. Sarah Foster was Martha's niece, daughter of her brother William Gyles. Elizabeth Collins: daughter of Martha's brother Joseph Gyles. Mary Williams was probably another daughter of Joseph Gyles. Thomas and William Aldridge were the sons of Grace, daughter of Martha's brother William Gyles. Mrs Jane Worrall, previously Langley, was another daughter of Martha's brother William Gyles. Daniel Beck of Amersham, barber-surgeon, was one of the trustees of the Baptist meeting-house at Amersham, and the two men named after him were probably also representatives of Baptist groups.